I started this over Christmas. This was my second crochet project at the time, so I was very hesitant, as the fail probability was obviously very high. But I fell in love with Doris Chan‘s designs, and felt I just had to at least give it a try. And I managed! Doris Chan’s patterns are very exhaustively explained, so even though you are making something rather structured, she really guides you through it. My only newbie trouble occured after I’d done the underarm joining and wasn’t sure how to join the yarn again; I asked for help on Ravelry, and lo and behold – Doris herself responded in minute detail within the hour! But I wanted something a bit more special than a pullover. The yarn is called Multico, and is made by a French brand, Plassard. The colours immediately reminded me of P’tite Mignonne’s fur. I did crochet the ribbed collar as per the original design, but it turned out too bulky on me even when crocheted with a smaller hook, so I frogged it. The next challenge was the blocking. I blocked the dress onto my mattress (no carpet here! ), and the stitch pattern opened up beautifully. If you want to read the journal of this dress’s making, check out this page in my ravelry profile. This may further explain to you my current obsession with crochet. Now I have gained enough confidence, the possibilities are endless. My friend Molly was spot on in her comment the other day: what is fantastic with knitting/crochet, is that you are actually creating your own fabric, with the structure of your choice, and in the shape of your choice. Of course, it also means that if you make a project a size too large or too small, you can’t let seams out/take seams in as with sewing. I just finished a bolero jacket in the yarn I showed you last time, but it’s turned out too large for what I had in mind, so I’m going to frog it all and restart.That’s not the end of the world. I enjoy the sheer act of crocheting, so it’ll get done when it’ll get done. Crochet has greatly contributed to my relearning how to keep stress at bay and put things in perspective. 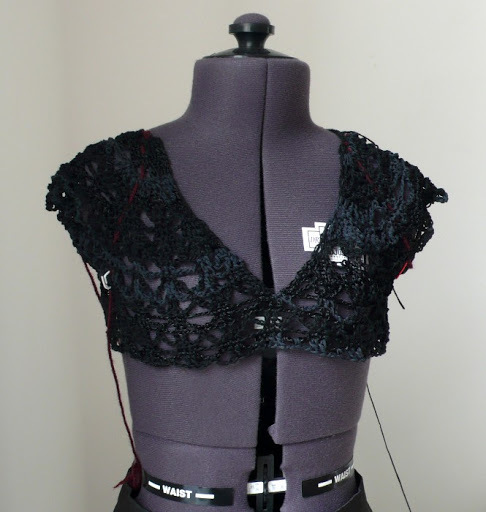 I am also currently working on a top for Spring – another Doris Chan design, the Belle Sleeve Pullover, which is available as a free download. That is such a beautiful dress! I have a couple of Doris Chan's book, but have never attempted any of the projects. Perhaps you will inspire me to give it a try. I saw your dress on Ravelry yesterday and saw how quickly she responded to your problem. I am having fun working on a Doris Chan top now. I love how you lengthened it into a dress. It looks great with the tights and boots. Wow, that is a fabulous dress. You look so cute all styled up like that. Not bad for a beginners project!! Te voilà déjà devenue une pro du crochet ! LOVE the dress!!! Please don't get me excited about another hobby though, I'd never get any housework done. Our high today is suppose to be 78 degrees, and it's the first day I've gone without my trusty fleece jacket. Bring on the warm weather, I say. très joli modèle! tu nous montres plein de talent caché! euh, côté météo, la même par ici, mais c'est plus courant! What a lovely dress! It indeed looks like P'tite Mignonne's fur. 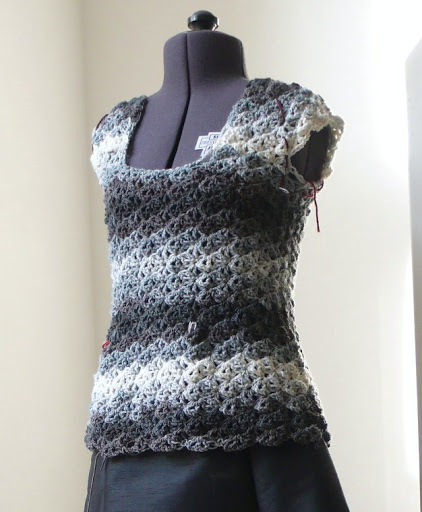 How brave to attempt a garment on you second crochet project. I am still going on with socks and would like to try some mittens. Then it's back to cross-stitch for me. How odd to see the snow on a palm tree!! I love your dress! You wear it well. Sewing and knitting are my 2 favorite hobbies. I can't even rank which one I like best – depends on the day. That is such a lovely dress and really perfect with your leggings and top. Tres chic! I can't believe that this is your second project, it's so wonderful. Thomas Friedman said in his column in the NY Times, that we shouldn't call it global warming, but rather global weirdness. The weather patterns seem to be really 'weird' lately, that is for sure. That is stunning, Isabelle. You never fail to amaze me with your talents!! Lovely dress! It looks perfect on you. You are unbelievably talented to crochet such a dress so soon after learning to crochet. Wow! It turned out beautifully. You have such talent; I'm envious. Your dress is GORGEOUS! I never knew crochet could be so form-fitting and fabulous. You look great in it. Fabulous dress! Great color, great fit – very flattering! Cette robe est superbe et te va très bien. Il faut bien ça pour supporter les “douceurs” du climat du sud, non? Isabelle, ta robe est superbe et te va très bien. C'est vrai que c'est très relaxant aussi de tricoter ou de crocheter. Et pour ce qui est de la neige à Montpellier et dans le sud, j'ai vu ça aux infos, c'est fou! Ici à Nantes il fait bien froid mais on a échappé à la neige! Wow! To think crochet could look that good! Well done – it looks amazing 🙂 And I don't mind what you show on your blog – it all looks great. Love the snow picture too! What a gorgeous, gorgeous dress Isabelle! You've really taken to crochet like the proverbial duck to water 🙂 Great job! Very cute dress – I love the way the yarn self-striped when worked into the pattern. I love your dress, and you are really tempting me to learn to crochet with all of your new things! Dear Isabelle, what a gorgeous dress. You are so clever with needlework. Your crochet dress is wonderful! You started crocheting just a few months ago and you're already making dresses. And beautiful ones, too. It almost make me want to start crocheting again. I learned as a child, but never liked it much. But I would like to have such a pretty dress! Ta petite robe est tout simplement merveilleuse, je veux la même pour ma fille, hihihi ! Mille baisers et caresses à Lady Violet ! I love all manner of crafts and needlework. 🙂 And people's stories. And cats. And gardens. And well, I guess the thing I'm trying to express is that I enjoy the voice you share here in your blog, no matter the subject matter. Beautiful wee dress and also a lovely yarn. Ravelry is one of my favourite places on the web! What a beautiful crochet dress. I haven't tried any of Doris Chan's crochet patterns but after seeing your dress I might just have to try one. Great job! Gorgeous dress. I am in awe of your crochet skills. I keep trying to learn but can't seem to get the hang of it so will stick to sewing at the moment. Isabelle, that's lovely! You're making me want to learn to crochet and knit, even though I fear having another activity that will cause me to stash. (I don't have space for a yarn stash). Brilliant idea to use something that coordinates with Miss Kitty's fur, since we know she'll shed on it at some point. Palm tree with snow . . . very strange. Excellent job, Isabelle! So lovely! I shall have to check out her designs. That dress is so stylish! Nobody would guess it is only your second crochet project! And I just love that last photo. Your crochet dress is beautiful! The weather is very strange lately. You are getting snow and here in Nova Scotia we are getting unseasonably warm temperatures when we are usually getting snow in March. Can't wait to see how your pullover turns out. Very pretty so far! I like your headbands. Hope your ear is completely well now. That's really amazing! I can't believe your a newbie at crochet! !